Okay, I admit it, I’m addicted. I watched nearly all 6 hours of opening games coverage and spent the better part of this past weekend glued to the couch. I’ll watch the prelims, the qualification rounds and the warm-ups. It’s the drama, the thrill of competition and the awe-inspiring dedication of our young and old Olympians that keep me captivated. So far this summer Olympic season hasn’t disappointed. Phelps failed to medal in the 400 IM as Ryan Lochte began his coronation as the new king of the games. The North Korean women’s soccer team was stunned when the video board at the soccer field displayed the South Korean flag next to the players’ names. Those events were certainly tweeted and commented about on Facebook, but other Olympic hullabaloo had its origin on social media. 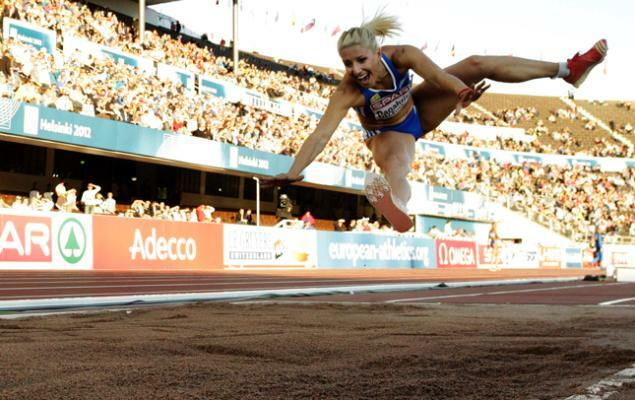 Before the games even began, triple jumper Voula Papachristou of Greece was expelled from the games for remarks she made on Twitter. On July 25th the Hellenic Olympic Committee said that Papachristou was “placed outside the Olympic team for statements contrary to the values and ideas of the Olympic movement.” Papachristou’s tweets related to the appearance of the West Nile Virus in Athens. She wrote: “With so many Africans in Greece, the West Nile mosquitoes will be getting home food!! !” Her comment was obviously inappropriate in jest or otherwise. There was immediate backlash that Papachristou attempted to justify by writing, “That’s how I am. I laugh. I am not a CD to get stuck!!! And if I make mistakes, I don’t press the replay! I press Play and move on!! !” Papachristou is not the only one to encounter severe repercussions for social media comments and postings. In a more controversial reaction, the Australian Olympic Committee (AOC) penalized a pair of swimmers for their social media behavior. 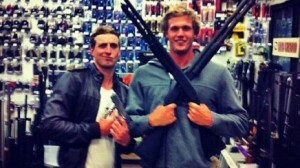 Last month Nick D’Arcy, who races in the 200-m butterfly, and Kenrick Monk, a freestyle swimmer, wielded weapons while posing for a picture in a California gun shop after a meet. After they posted the photo on Facebook, it sparked outrage. While no comments were included in the post, the AOC has stated that D’Arcy and Monk would be forced to leave their Olympic confines immediately after their events. They were also banned from using social media during the games. It should be pointed out that the availability of firearms is much broader in the US than Australia; therefore there is some context that must be understood when interpreting the AOC decisions. At the time of this writing, D’Arcy and Monk are still seeking pardon in order to extend their stay in London. Call it a perfect storm given that the average age of individual gold medal winners at the Olympics since 2000 is 17, and the massive subscription base of Twitter boasts more than 500 million users. Every day they tweet 340 million times and search for things 1.6 billion times. Facebook membership has leapt to 845 million since the 2008 Olympic games. NBC has counted more than 15 million London 2012-related tweets in the past few weeks, with an average 2,300 popping up every minute. It’s not hard to imagine similar controversy caused by employees, partners, business associates or board members through inappropriate or questionable use of social media. With the backdrop of the 2012 Olympic social media gaffes, I thought it time to remind readers how important it is to introduce a social media policy as part of your standard human resources handbook. I would argue that the real value of instituting some measure of a social media policy is simply to have the discussion. While I am fervent advocate that common sense should always guide behavior, it’s important to provide some definition of common sense in the context of social media, lest tweets and Facebook posts become the target of e-discovery collection. Social media is simply a fact of the contemporary environment and therefore must be addressed given the potential consequences of improper use. Be cognizant that social media inherently mixes business and personal lives – Friends, as well as co-workers, management and customers may all have access to your posts. This is not to say organizations need to abridge first amendment rights, but the tweetosphere is wide open and non‐public information of the organization (including confidential or IP) should NEVER be posted online. Does this post adhere to the organization’s code of conduct and values? – A good rule of thumb is simply to ask whether my boss’s boss would encourage this post. If the answer is, “no” it’s best to skip this tweet. Remember you are responsible for your actions. – Things said on social media that negatively impact the organization are the responsibility of the individual that made the post. I’m no management genius, but I do believe responsibility – which is understood and encouraged – is a precursor of sound judgment. Negative posts should be referred to subject matter experts – Those with military experience will remember this as “watch your lane”. If the negative post is worth responding to, let the expert respond with the support of management. Don’t involve yourself in online verbal sparring matches. It reflects poorly on the organization and omits one of the doctrines of customer service: the customer/client is always right, even when they are wrong. These reminders are not intended to be adopted as the social media policy of any organization, but they can serve as a good set of guidelines to encourage thought and discussion within your company and firm. We have seen and will continue to see social media impact the Olympics as well as civil and criminal cases. Before I head back to coverage of the 2012 Games, I’d like to encourage organizations to adopt a social media policy and make sure when those policies falter (and they will), you have properly accounted for social media in your e-discovery practices. I’ll cover this topic in a future post, although I work and partner with a set of experts, so contact us today to learn more or call 800.574.5199.